So the hubs was not looking forward to this past weekend AT ALL. You’d never know that it was because he had a milestone birthday coming. That’s right, the hubs turned the big four-oh. We post-poned his birthday dinner until one night this week when he’s actually home to eat. Crazy hours at work. The budget’s been tight, so we’d already agreed no gifts this year. He really was content with letting his big day come and go, especially since he didn’t really want to shine a spotlight on the fact that he now officially feels ‘old’. It took a lot of work, and both our families pitching in but I was able to pull off a surprise party Saturday night that totally stunned him. I mean he was floored. He had no idea, despite me being convinced he suspected something. It didn’t even click seeing friends and familys’ cars in the driveway as we pulled up. He thought it was a Christmas party being thrown by his Mom. The look of shock on his face when he walked in and did a double take before everyone shouted ‘surprise’ was absolutely priceless. As was the giant bear hug I got after he’d made his rounds saying hello to everyone. It was awesome, and a memory I will cherish forever. That being said, I knew neither of us were going to feel like getting up and cooking breakfast bright and early Sunday morning when the kids were hungry. 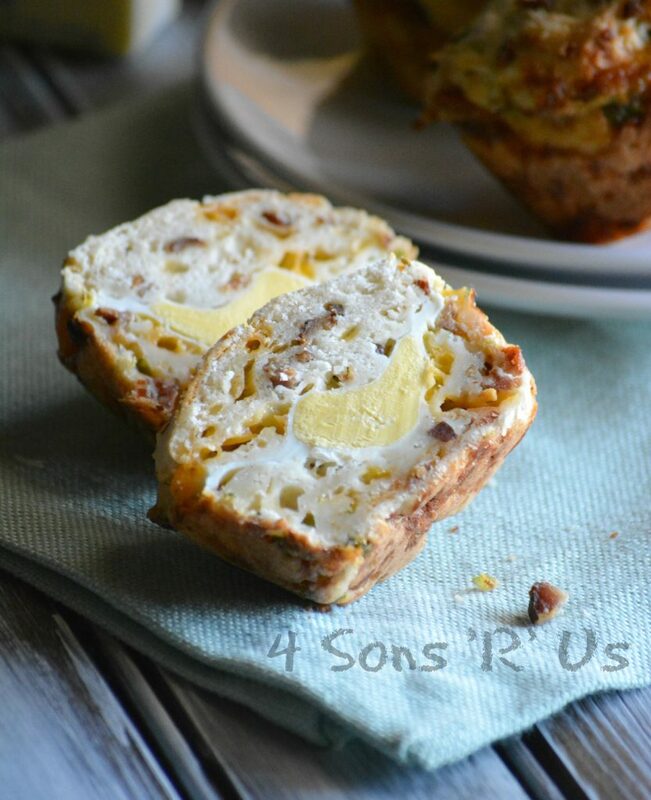 Luckily, these Bacon Cheddar Hard-Boiled Egg Breakfast Muffins are a complete breakfast all in one hand held package when paired with a glass of milk and/or orange juice. Crisp crumbled bits of bacon and thinly sliced green onions are stirred into an easy batter with a whole hard boiled egg baked right in the center. Brushed with butter for a golden brown finish, these are THE next big breakfast muffin. Make a batch, and discover their greatness for yourself. 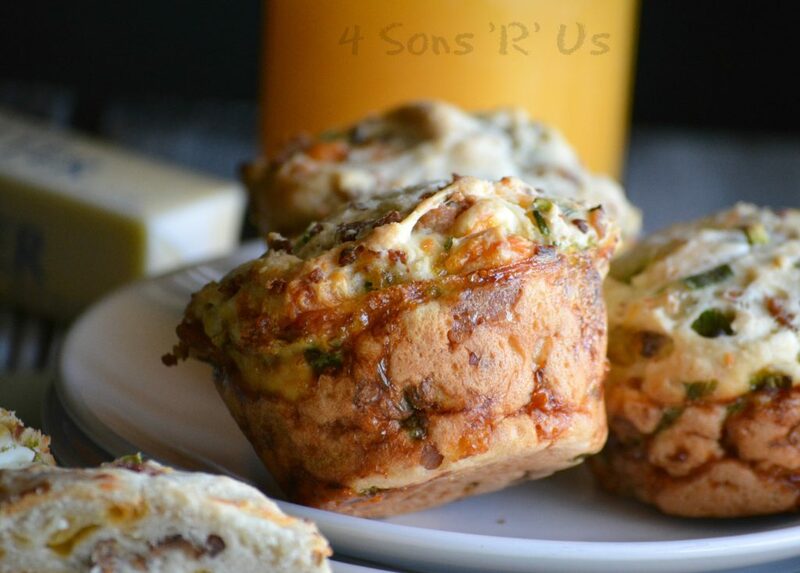 A yummy all-in-one breakfast muffin that features sharp cheddar, crisp crumbled bacon, thinly sliced green onions, and a hard boiled egg baked right in the center of a buttery batter. Add the dry ingredients to a large mixing bowl and use a fork or a whisk to stir together until evenly incorporated. In a separate bowl, stir together the wet ingredients until well combined. Without over-mixing, slowly stir the wet ingredients into the dry, just until the batter comes together. Use a spatula to fold in the cheese, onions, and bacon. Spray a jumbo/Texas sized muffin pan with non stick cooking spray. Place 3 tbsp of the batter into 4 muffin tin holes. Smack the tin down evenly on the counter a few times to settle the batter. Use a shot glass to make a deep hole/depression in the batter for the egg. Carefully crack an egg into each hole, into the center of the batter. Divide the remaining batter between each hole and gently spread it out to completely cover the egg. Brush the top of the batter with melted butter and bake at 350 degrees for 20 minutes, or until the muffins are golden brown. Remove the muffin tin from the oven and rest for 5 minutes. 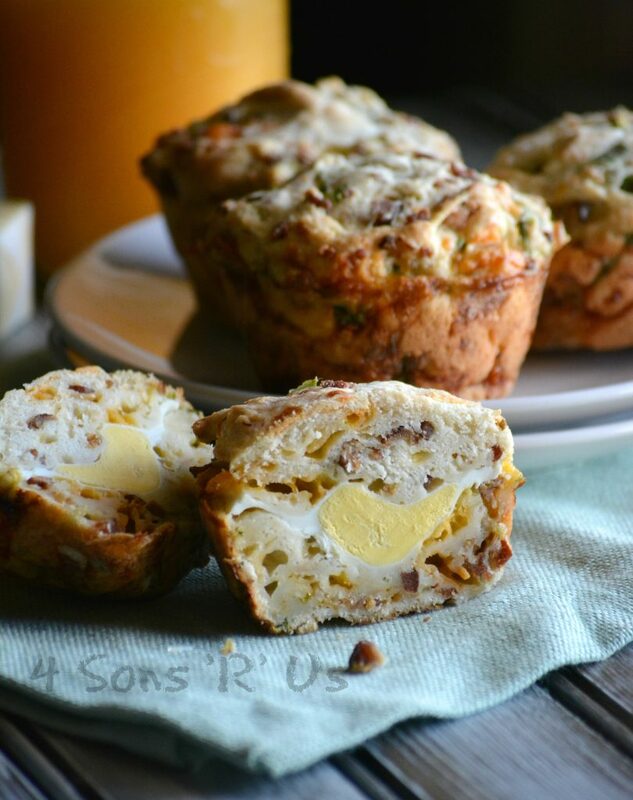 Transfer the breakfast muffins to a cooling rack to finish cooling. Serve them warm, with a glass of milk and/or orange juice. These can also be kept in a sealed container in the refrigerator, for up to a week. This is a great idea! I can eat eggs for breakfast, lunch and dinner and am always looking for different ways to enjoy them. 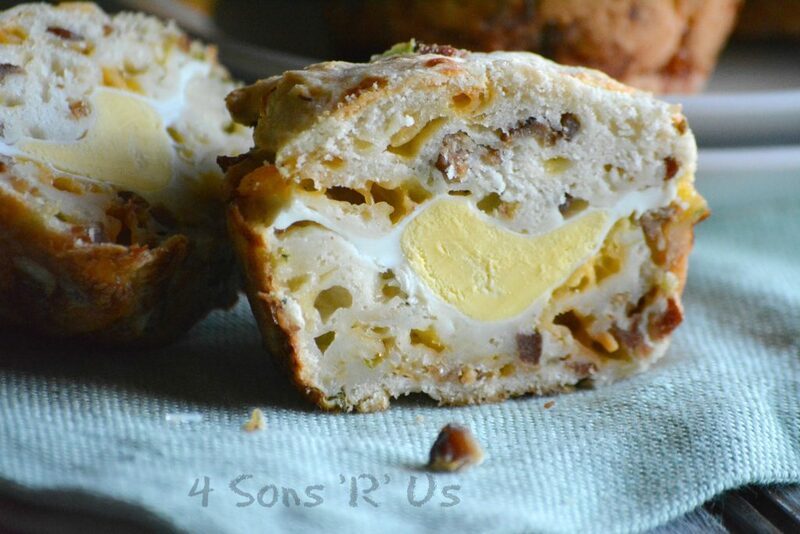 Gonna make this soon…. This looks absolutely delicious! Thanks for sharing at Fiesta Friday!